A space and cost conscious way to get into the TrueStrike experience, great for practicing with irons and drivers alike. TrueStrike golf mats are the latest advancement in golf mat performance. They are revolutionizing golfers playing experience at driving ranges and golf courses by replacing unrealistic, hard synthetic grass golf mats with a realistic representation of a fairway. By using TrueStrike rather than ordinary mats, which produce unrealistic shots, the "fairway forgiveness" will actually help to improve your practice experience by replicating the shots they would experience on the fairway. You will love the realism the "fairway forgiveness" effect produces and see real benefits previously unobtainable from range practice. TrueStrike golf mats have a "ruckable" top surface and a gel-filled divot simulating subsurface which accurately recreates the effects of playing off a natural fairway by allowing the club head to play through the playing surface as it would on turf. The "fairway forgiveness" effect produced by TrueStrike golf mats means that the shock and the vibration associated with hitting from ordinary mats is substantially reduced. With TrueStrike your customer's play with the confidence of knowing they will be protecting themselves from future problems and avoiding the aggravation of existing injuries. • Elements can be changed as and when necessary. TrueStrike is an British company that has invented, designed and built a revolutionary new golf mat, called TrueStrike, which more accurately represents the feel of playing on a natural fairway. 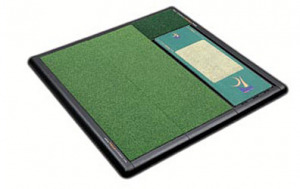 To achieve this realistic representation of the fairway the TrueStrike golf mat makes use of a unique patent pending "ruckable" top surface that works in conjunction with a gel-filled divot simulating subsurface. How does TrueStrike differ from traditional golf mats? We at TrueStrike are confident that our innovative new golf mat truly simulates the feel of playing off a natural fairway better than traditional golf mats. This is achieved as our patented "ruckable" playing surface and gel-filled divot simulating subsurface work together to closely emulate the effects of playing a shot from a natural fairway. A direct result of TrueStrike's more realistic representation of a natural fairway is a phenomenon TrueStrike call "fairway forgiveness". Our surface plays and feels like a natural fairway. A fat shot will respond by losing distance, height and accuracy, a topped shot will bury into the surface and kill the shot and a well-struck ball will fly as expected. That's "fairway forgiveness". It will improve your game and make you practice for longer and come back more often. TrueStrike has used the word "ruckable" to describe the unique way that the TrueStrike top surface reacts, in conjunction with the gel-filled divot simulating subsurface, when hit with a club head. The word ruck is usually used to describe the bulge that forms when a piece of material moves. In this case TrueStrike golf mats are "ruckable" as they are able to stretch, react and ripple when struck with a club head. This allows the club head to impact into the gel-filled divot simulating subsurface creating the revolutionary "fairway forgiveness" effect. Can TrueStrike be left outdoors? Yes absolutely it is designed for all weather and all climates. Can TrueStrike be used by left and right handers alike? Absolutely what ever your preference. The single unit can simply be played by physically rotating the gel section, or by configuring the unit as a double ender or set up as a centre hitting position. How durable is TrueStrike ? TrueStrike will provide many years of service to the user in either the domestic/home environment, or the commercial driving range or golf club, as long as it is properly maintained. Because all parts that wear such as the strike surface can be changed as and when required. The strike surface alone has an expected life of a massive 55,000 iron shots before it will need replacing and with a replacement cost of just 55.00 USD it is much more affordable than replacing the whole mat as you would need to do with traditional mats. One further point TrueStrike always performs at 100% throughout its life. If you have any questions regarding the TrueStrike Static Golf Mat, please give us a call, we would be happy to help you with any questions you may have. Write an online review on the TrueStrike Static Golf Mat, and share your thoughts with others.